This topic contains 1 reply, has 2 voices, and was last updated by admin 1 week, 4 days ago. I am trying to have a form pass itself into a PDF that I made, I gave the fields names (in the pdf) and am matching the form on my website to the names of the pdf fields, but when i try to download and open it, I get a notice that says “error failed to load PDF”. Is there a tutorial I can follow to set the entire pipeline up? The documentation on the site is pretty lacking, I saw that someone else has (had? idk if they fixed it but they did not update their post if they did) the same problem and no solution was provided.. 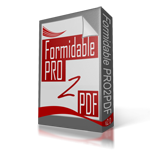 I made the PDF in acrobat, the form in Formidable, and I made all of the ‘correct’ mappings in the pro2pdf settings..
Beside that, we offer outstanding support to get the job done.
. Are you able to create a merge using the EXPORT PDF button on the EXPORT tab after selecting the Form, Dataset, and Field Map Layout from the top three dropdown fields? If yes, then reply with the shortcode you are using and a screenshot of the EXPORT tab after selecting the Form, Dataset, and Field Map Layout from the top three dropdown fields, be sure to include at least the first row of mapped fields, and upload the PDF to this form. If no, then there is likely an issue with the PDF form. Try uploading the PDF Form to pdfescape.com, then save, download to your drive, and upload to the plugin… (this method is known to repair non-compliant PDF forms). Or, upload the PDF Form to this form, you can optionally enter site credentials if you require us to login and take a look.